It’s dinner time and the tv is offering an overview of how Susan cooks rice in the White House, why Russia is our ally in Syria and enemy in Ukraine, how to wear climate change fatigues, way to waddle by a fat actress named Kim, ugly duck hunters who need a shave, and commercials for groups that want $18 or $19 a month from me. Another $19 grisly grovel is spewed by something called Wounded Warriors, an ad that emphasizes cripples, burned faces, stumbling speech. How many of this group’s staff/execs make more than $200k a year, and how many tens of millions were raised last year, not spent on programs, just saved? Try charity navigator for their rating and tax returns of this project, and you might decide your money could be better spent elsewhere. Perhaps, the “less than $20” first place award should go the Humane Society of the United States (HSUS), which has its own $19 begathon, showing tortured animals, including cats and dogs, so even our children can be horrified by yet another paid commercial that strives to make mom and dad feel guilty. Teach them before they are seven or eight that somewhere there is evil in this world, and you can cure it by catering to hucksters. What better time to remind us than at 6 p.m. when the children are chewing their vegetables. 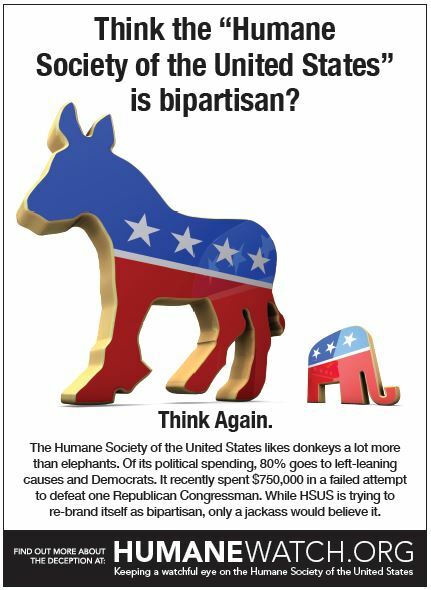 Criticism of the expensive fund-raising of some groups reaches a high against HSUS with efforts by humanewatch.org An entire website rips into HSUS, and a visit there and to the charity navigator link are recommended. Another disturbing aspect of these $19 groups is not just how much they spend on charity, versus paying for all those tv ads, it is their influence on the public. Do our veterans need grandma’s last buck to help veterans, or should it be the taxpayers’ responsibility to improve the VA? Are private organizations really providing prosthetic arms and legs, or is this just another Madison Avenue lie? With hospital rooms costing us $3,000 or more a day, should we appropriate our children’s lunch money to send a high-paid, top-heavy organization almost an Andrew Jackson every month? The initial offense of these commercials is the time they air – visible to small children, keyed to family time, and yet providing another reason to drink heavily at dinner because of what we see on tv. For some, the answer may be turning off the box, but for the other 300 million or so Americans, the charity gravy train ride will continue. With no government regulation and influential folks slavering at the chance to cloak themselves in supposed good deeds, no big contributors will ask that these abuses are stopped. Did anyone say: “campaign finance reform”?